The subject of optimizing the presentation of content within a domain for discovery by search engines falls into the activities of information seeking and search behavior. In this month’s column, I’ll discuss how to put search engine optimization (SEO) in its proper place in the grand scheme of things, demonstrating its relationship to information architecture. In my last column, I introduced an order grid that details the key competencies, or areas of interest, of eight major UX design practice verticals. I created this order grid to help identify the required competencies for IA practitioners. Some of you may have noticed that SEO did not make it to that list—not because SEO is not part of the design and development process, but because, arguably, SEO is part of the subject matter of information architecture strategy—within the fifth tier of the IA practice vertical. In theory, the subject of optimizing the presentation of content within a domain for discovery by search engines falls into the activities of information seeking and search behavior. For the Web, this practice is consistent with the practice of information architecture —“the effort of organizing and relating information in ways that simplify how people navigate and use content on the Web.” Therefore, information architects and other practitioners of information architecture should equip themselves to do SEO. SEO’s primary concern is improving the visibility of a Web site or a Web page in search engines via unpaid search results. Web site owners want to make their Web content discoverable by search engines, so there is a need for search engine optimization. SEO’s primary concern is improving the visibility of a Web site or a Web page in search engines via unpaid search results. In Table 1, I’ve highlighted three internal SEO concerns with which information architects should be familiar. I’ve also included some example approaches and disciplines that play key contributing roles. Search engine optimization centers on the technical tuning of content, content relationships, and code to improve a Web page or site’s prominence, or ranking, in search engines. However, Shari Thurow, an information architect with expertise on the subject of SEO and a current board member of the Information Architecture Institute, goes one step further. She states that SEO should consider “how users/searchers arrive at a Web site via Web search engine listings and links from external, third-party resources.” The important part of this statement is her reference to “links from external, third-party resources.” Which means, while search engines are interested in the content usage and relationships inherent in your site, they are equally interested in knowing which other sites on the Web demonstrate interest in your content. As many of you probably know, when others link to content on your site, they indirectly contribute to your site’s relevance to search engines. What you might not know is that, even though the attention of most SEO strategies may be externally focused—meaning their focus in on how information about your content surfaces in search engines—good SEO planning naturally requires significant technical and UX-based domain knowledge. For example, failing to correctly understand the aboutness of externally located links to your site can reduce information scent for users and, over time, reduce the relevancy of the linking relationships your site may have across the Internet. Google, for example, is actually interested in the relevancy of the terms sites use for hypertext, alt tags for images, and the content that follows. Doing a poor job on these not only diminishes the usability of your content for users across the Web, it negatively impacts the overall search relevance of your content. In Table 2, I’ve highlighted the external SEO concerns that impact the effectiveness of content mapping within your domain. Who links to your content? Credible related sites with positive rankings can improve your ranking. How many third-party domains link to your content? Search engines view inbound links or backlinks to your site favorably. How well do the labels and URLs of external link nodes communicate their true intent? Context and language are crucial. Search engines measure how well embedded keywords relate to the content to which they link. While having a high search engine ranking against a field of competitors or similar content providers may not always be the focus of every site, content discoverability should be. Therefore, if you have a page that discusses the feature details of a product or service—regardless of how popular it may be—someone should be able to find it in any credible search engine by querying the product name along with the words product details. Search engines offer a useful way for users to discover and navigate to content using natural language—as opposed to requiring users to remember and type vanity URLs. Users assume that entering a few select words into a search field will point them in the right direction. Consequently, you should consider how to help search engines discover and efficiently deliver users to your content, while requiring only minimal data input on the part of users. Discoverability, or findability, and navigation fall into the UX design practice of information architecture. Flawed navigation, poor information and content organization, and weak information relationships not only confound users who visit your site, they disengage search engine spiders—preventing them from indexing valuable content on your site. Flawed navigation, poor information and content organization, and weak information relationships not only confound users who visit your site, they disengage search engine spiders—preventing them from indexing valuable content on your site. When a site has a sound information architecture, it satisfies visitors and naturally creates opportunities for extending your content to the rest of the world through search. For this reason—and with all due respect to the practices of content publishing, visual design, interaction design, and computer science—a sound information architecture for a Web site provides the essential foundation for search engine optimization. Even when there is no search engine marketing (SEM) strategy in place for a Web site, practitioners of information architecture have a responsibility to do their part to ensure the discoverability of content by both people and machines, and both internally and externally. So, as you contemplate the navigation for your site, you should always consider your cross-domain IA strategy for how people can navigate to your root domain from search engines and third-party sites—for example, www.abc.com—or directly to any page on your site—for example, www.abc.com/sub-directory/page. Let’s say, for example, that your Web site enables users to purchase shoes. As a result, it’s likely that successful exposure of the site depends on an integrated SEM campaign. If this were the case, you should expand your IA analysis, building assumptions beyond the content publishers, and include SEM professionals to understand the complete context of the information domain. This enables you to provide the most informed IA recommendations. 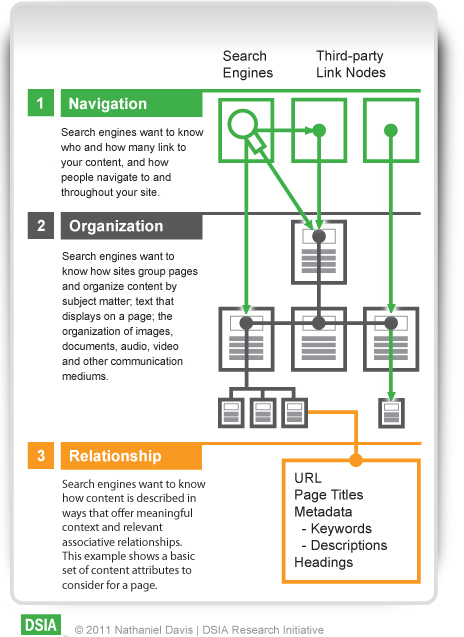 To visualize what all of this means to information architecture, Figure 1 frames how SEO relates to the first three tiers of IA practice: Navigation, Information Organization, and Information Relationships. Navigation—Navigation forms the most concrete connection users have with the work product of information architecture. This is why many view navigation as the tip of the IA iceberg. Since navigation relates to SEO, determine whether you need to consider how link nodes might formally display within third-party domains like a search engine or Web site. Information Organization—Information architecture must provide a sound organization for pages and content on Web sites. Planning a Web site’s page hierarchy can be critical for users as well as search engine spiders. Because of the convenience of using internal and external search engines and contextual and inline navigation methods, users less frequently navigate using taxonomy-structured menus. Search engine spiders, however, have a greater appreciation for formal, hierarchal content structures. Determine whether your organizational approach needs to extend beyond your local domain and into the domains of search engines, third-party sites, and emergent social grids like LinkedIn, Facebook, and Twitter. If so, this may impact your final IA recommendations. Information Relationships—When you create and implement a metadata schema, you naturally position your content for discoverability by search engines. Page titles, page descriptions, keywords, and image descriptions are, at a minimum, attributes that an information architect should consider when creating a data model for content. This level of discipline benefits even the smallest of projects and translates well to larger, managed environments with dynamic content. The essence of sound SEO has its roots in and is part of the practice of information architecture. Now, none of this means information architects should begin positioning themselves as SEO professionals. Nor should practitioners of SEO begin calling themselves information architects. However, what this does suggest is that, in theory, the essence of sound SEO has its roots in and is part of the practice of information architecture. Since search is a form of navigation that accommodates a particular set of information seeking behaviors, IA practitioners should have a sound understanding of SEO in order to consider the implications of their IA recommendations as they relate to the discoverability of their content by search engines and other third-party sources. The idea of SEO’s being part of the practice of information architecture enables practitioners to offer a more complete perspective on smaller project teams and serves IA practitioners well when working within larger organizations. The relationships between information architects and SEO and SEM professionals should be stronger than they are today—simply because of the fact that they are codependent. Don’t worry—SEO is not SEM. SEM professionals offer keyword research, strategies for link development across external domains, competitive analysis, and operations around paid and unpaid search engine marketing. To be clear, SEM is not a practice tier of information architecture, but falls more in the domains of marketing and content strategy. What’s good for Information Architecture is good for SEO. However, the inverse it not the case. Creating a sound Web site information architecture from an SEO perspective does not consistently produce the results of a traditional IA approach. There’s a better chance for success with smaller information domains. But as the size of information domains grow, core SEO techniques, by themselves, fail to produce sound information architectures. While SEO does satisfy the behavioral needs of people, it is primarily a technical strategy, providing solutions for structuring content that are based on the behaviors and syntactical requirements of search engines. 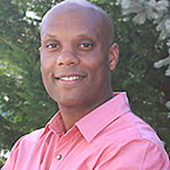 SEO does not usually consider insights into more contextual human-to-computer interaction behaviors and information needs, which are necessary to the practice of information architecture. SEO is a static, cross-domain IA strategy, in which externally placed link nodes generate traffic for a target domain. In the case of a static, cross-domain IA strategy, the external link nodes merely act as points of engagement that pull users to interact with information in a single managed domain. The managed domain and the related domain in which the external link node resides do not share a common abstract construct. Davis, Nathaniel. “UX Design Practice Verticals.” DSIA Portal of Information Architecture, December 4, 2011. Retrieved December 4, 2011. Thurow, Shari. “Keywords, Aboutness & SEO.” Search Engine Land, August 27, 2010. Retrieved November 4, 2011. SEO is optimizing for people who use search engines. I and many of my SEO colleagues have been saying this and promoting this for years. I will be the first person to admit that most SEOs are clueless when it comes to information architecture—IA by perceived PageRank or IA by keyword research tools? Crazy. However, I dislike it equally when information architects, usability professionals, and UX designers/practitioners discount SEO due to stereotypes and misconceptions. There is a tremendous amount of research on Web searcher’s goals and behaviors—navigational, transactional, informational, and exploratory—from Andrei Broder, Jim Jansen, Ryen White, Maryam Kumvar, Dirk Lewandowski, and others. SEO experts truly understand the human/searcher aspects of search engine optimization, as well as the technical aspects. So, before dismissing SEO and basing conclusions on partial knowledge of the subject, maybe everyone should have a working knowledge of both the human and technical aspects of SEO.